Tawny Rower is the 527th highest place in Ireland. Tawny Rower is the most easterly summit and also the second most northerly in the Sheeffry Hills area. I parked at a forest entrance above Tawnyard Lough in Glenummera (L912678 D). If intending to do a traverse of the Sheefry Hills east to west this is a short road walk to the start of the climb of Tawny Rower and a 4 mile walk from the descent of Clashcarne at the western end of the Sheefrys. From the forest entrance follow the road uphill for a short distance before a winding drop down towards Sheefry Bridge. Turn left to follow a very rough track signposted for the Western Way [ note, this route for the WW appears to have been changed in 2012 ] along the bank of the Glenlaur River. Cross the river where the first stream joins on the opposite bank and follow this stream steadily uphill, as the ground levels out stay on the right side as ground is very wet. Nice views west up into Glenlaur Valley with Tievnabinnia at its head as follow the stream towards the col of Tawny Rower and Tievnabinnia East. Short steeper section as climb to summit area which is quite extensive. 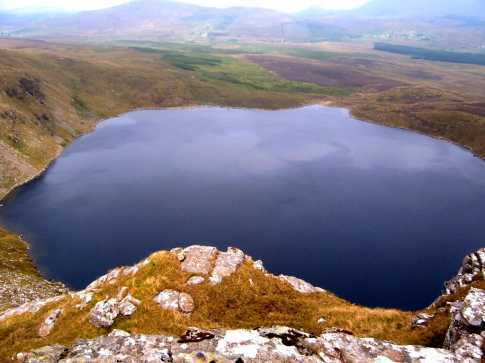 The summit is a little rise just above a pool of water and marked by a small cairn with a white stone.